(Continued on page 24) p l a y g ro u n d 22 Landscape Architect and Specifier News Above A year of design, public input and construction at Friends Park in Glencoe, Ill., led to the replacement of an old wooden play structure above a sand pit with new and accessible features, including a ramped play structure, net climber, swings and other amenities centered on a train trip theme. Friends Park, at the corner of Vernon Avenue and Tudor Court in Glencoe, Ill., was renovated in the summer of 2013, and has become a highlight of downtown Glencoe for children of all ages and abilities. The playground had not seen significant improvements since 1996, and contained an aging wooden playground before work began. 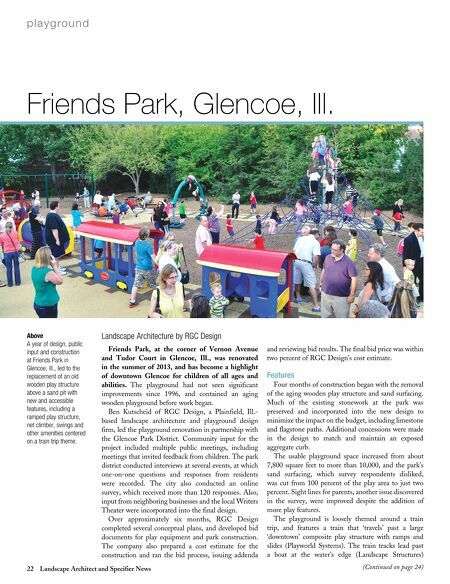 Ben Kutscheid of RGC Design, a Plainfield, Ill.- based landscape architecture and playground design firm, led the playground renovation in partnership with the Glencoe Park District. Community input for the project included multiple public meetings, including meetings that invited feedback from children. The park district conducted interviews at several events, at which one-on-one questions and responses from residents were recorded. 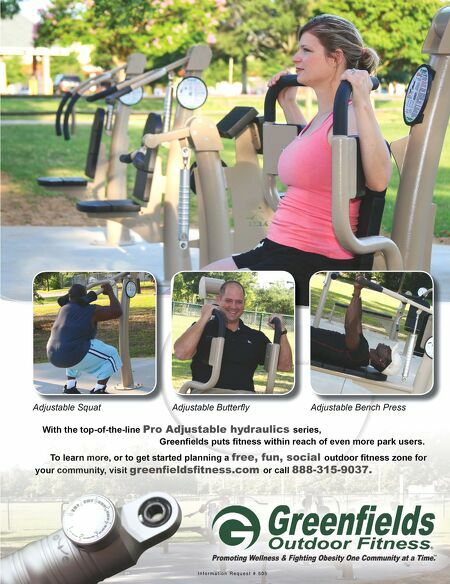 The city also conducted an online survey, which received more than 120 responses. Also, input from neighboring businesses and the local Writers Theater were incorporated into the final design. Over approximately six months, RGC Design completed several conceptual plans, and developed bid documents for play equipment and park construction. The company also prepared a cost estimate for the construction and ran the bid process, issuing addenda and reviewing bid results. The final bid price was within two percent of RGC DesignÕs cost estimate. Features Four months of construction began with the removal of the aging wooden play structure and sand surfacing. Much of the existing stonework at the park was preserved and incorporated into the new design to minimize the impact on the budget, including limestone and flagstone paths. Additional concessions were made in the design to match and maintain an exposed aggregate curb. The usable playground space increased from about 7,800 square feet to more than 10,000, and the parkÕs sand surfacing, which survey respondents disliked, was cut from 100 percent of the play area to just two percent. Sight lines for parents, another issue discovered in the survey, were improved despite the addition of more play features. The playground is loosely themed around a train trip, and features a train that ÔtravelsÕ past a large ÔdowntownÕ composite play structure with ramps and slides (Playworld Systems). The train tracks lead past a boat at the waterÕs edge (Landscape Structures) Landscape Architecture by RGC Design Friends Park, Glencoe, Ill.